● Add light to plants, stimulate their photosynthesis, help plants absorb nutrients, especially some trace elements, shorten the growth cycle, prevent the rampant growth of plants. Red: 620-630nm, 640~680nm - the best spectrum for planting flower and fruit. Blue: 430~440nm, 450~480nm - it is maximum peak points for vegetative growth and absorption. White LEDs: 6000-6500K - full spectrum / provide fill for all missing spectrums and add Lux. UV: 380~400nm - process of chlorophyll absorption begins. UV(ultraviolet) has the unique function of sterilization and kills phytopathogenic bacteria. IR: 730nm - there is little absorption by Chlorophyll here, but phytochrome uses a nice portion. Flowering and germination is influenced. 【Energy Saving】 These bulbs are small but powerful, 28 Watt equivalent and actual power consumption just about 6~9W, saving your 75% electricity bills each month. 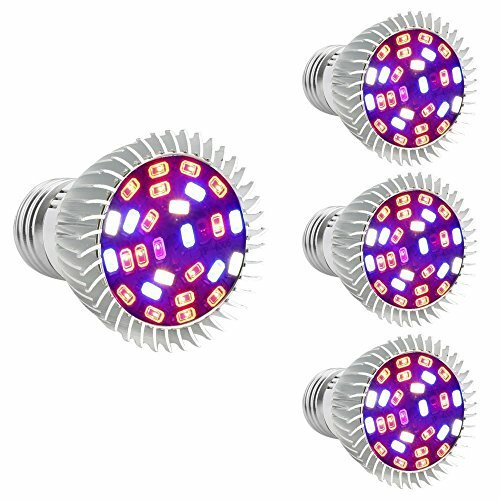 Note: Grow light's wattage is too high, it is easy to cause small and medium-sized burns, so you can't blindly select large wattage grow lights when purchasing. Grow lights should be purchased according to the needs of the plants. 【Scientific Exterior Design】 Build with heat-sink metal aluminum and design by turbine type cooling structure, significantly reduce the heat generated when the bulb works, increase the working life of the bulb. 【4 Pack Is The Reasonable Selection】 One bulb is enough to illuminate a small indoor potted plant without causing excessive energy waste. By placing four light bulbs around the medium or large plant, the plants can be exposed to more uniform light, so that the plants grow healthily and flourishingly. In addition, the extra light bulb is convenient to replace. 【Multi-purpose】 Widely used in greenhouse and indoor plants, potted plants, bonsai, grow tent, flowers, hydroponic systems and vegetable cultivation, in the darkness, rainy, snowy day and winter, to provide plant with additional sunlight, supporting photosynthesis. Package Included 4pcs Bulbs. Return and money back for customers within 30 days, ship replacement and free shipping to customers within 1 year. 【Full Spectrum&High Efficiency】 28pcs High-efficiency Epistar SMD5730 LED Chips: 15 Red+7 Blue+1 IR+1 UV+2 Daylight+2 Warm White. Contains all wavelengths 380-730nm required for plant growth. Reasonable ratio of red and blue light, provide the most efficient wavelengths of light to enhance photosynthesis performance hence improving plants' healthy growing. Add extra sunlight to the plants, stipulate the photosynthesis; help shorten the growth cycle, improve the health of your plants.